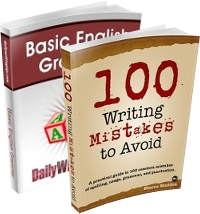 English Grammar 101: Sentences, Clauses and Phrases: Welcome to English Grammar 101, the newest category on Daily Writing Tips. I thought that creating a series of posts covering the basic grammar rules and parts of speech would be useful to many people, especially if you consider the diversity of our readership. On this first post we’ll cover sentences, clauses and phrases. Are You Sure You Mean “Moot”? : I just caught myself writing “the question is moot” meaning “the question is irrelevant or closed.” I immediately scrapped “moot” for a different adjective. Why? Because I remembered an occasion on which my son, a journalist, ruined the word for me by explaining that I was using it incorrectly. Is There Really Room for Error in Writing? : Writing is a battle. On one side: the force of your important message. On the opposing side: the forces of ignorance and misunderstanding. Your weapons: your words. Your support: the entire tradition of the English language. 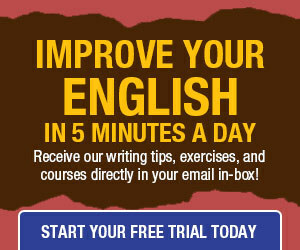 Can You Speak Your Readers’ Language? : Face it, we English speakers (which presumably includes you, since you’re reading this) don’t always read and write the same language, even if we all call it English. Sure, someone trying to communicate in a language that isn’t their native language may have a harder time being understood. But we understand that and make allowances for it. I talk more slowly (usually) when I’m not speaking English, and my listeners don’t expect me to speak perfectly. Among/Amongst: Is there a Difference? : I first heard amongst used when I went to live in England. To my ear it sounds quaint and very “British.” I especially like it in the expression “to put the cat amongst the pigeons.” If there ever was a difference between the two words, it is lost now. Malapropisms: Sheridan’s 18th century play, The Rivals, featured a hilarious character called Mrs Malaprop, who was apt to drop a verbal clanger whenever she opened her mouth. That’s where we get the word malapropism from, though its real origin is in the French phrase mal à propos, meaning inopportune or not to the purpose. Five Tips For Writing Great Web Content: Writing for the web is another great freelance writing market. It’s already huge and it’s growing every day. There’s so much web content out there that you need to make yours stand out. Here are four ways to make your web content appeal to readers.